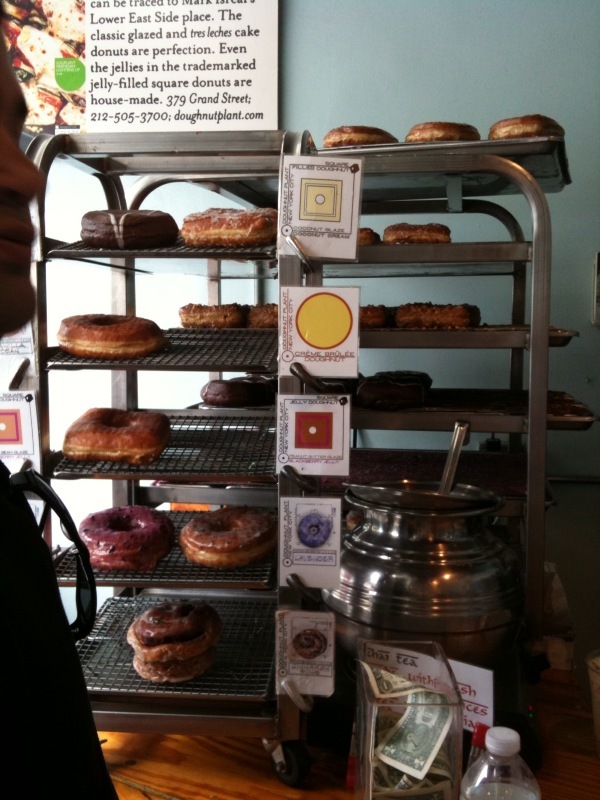 The Doughnut Plant is no ordinary bakery. For starters, their hours are “6:30 AM-UNTIL DOUGHNUTS RUN OUT.” Famous for making doughnuts “the new cupcake” in New York, the Doughnut Plant has revitalized the art of homemade doughnuts with their creative, gourmet, and seasonal flavors. Case in point: the Crème Brûlée doughnut, one of the signature delicacies that put DP on the map. The doughnut is hand-piped full of rich, vanilla cream, then topped with shiny, crackling, sugar that’s toasted with a chef’s blowtorched, just like an individual serving of the doughnut’s namesake dessert. The famous chalkboard that's chalk full of DP's seasonal offerings. Besides drawing attention for their immaginative flavors, Doughnut Plant has also earned accolades for their innovative preparation. Specifically, DP makes heavenly, trans-fat free doughnuts, going against the doughnut dogma that hydrogenated oils are absolutely essential to producing a light and airy doughnut. The Doughnut Tray (all caps required) at the Doughnut Plant's tiny counter. For my Trusty Sidekick’s birthday, we ventured down to the Doughnut Plant (located at 379 Grand Street (Essex Street) on the Lower East Side) with a few friends to check out these claims for ourselves. 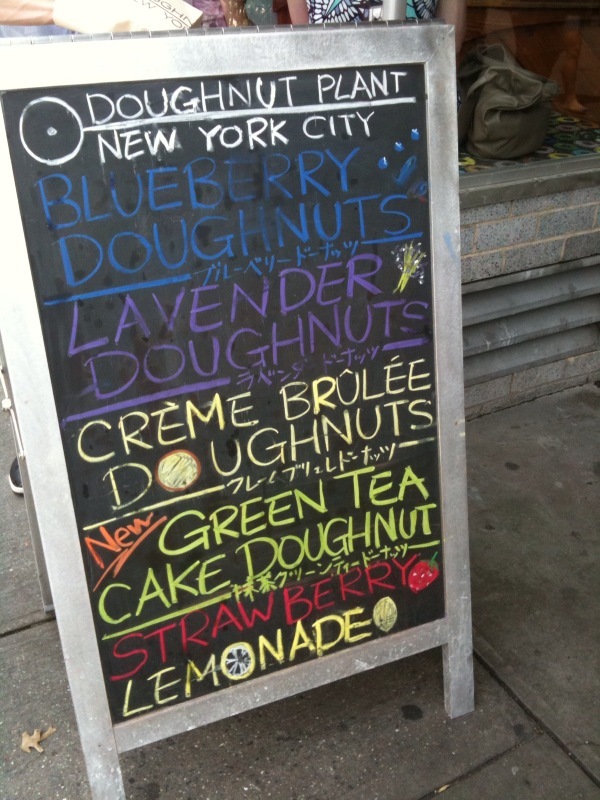 And at $2.75/doughnut, we were able to try lots of flavors for not a lot of dough! Trusty insisted on ordering the classic glazed doughnut (in order to establish a “baseline”). 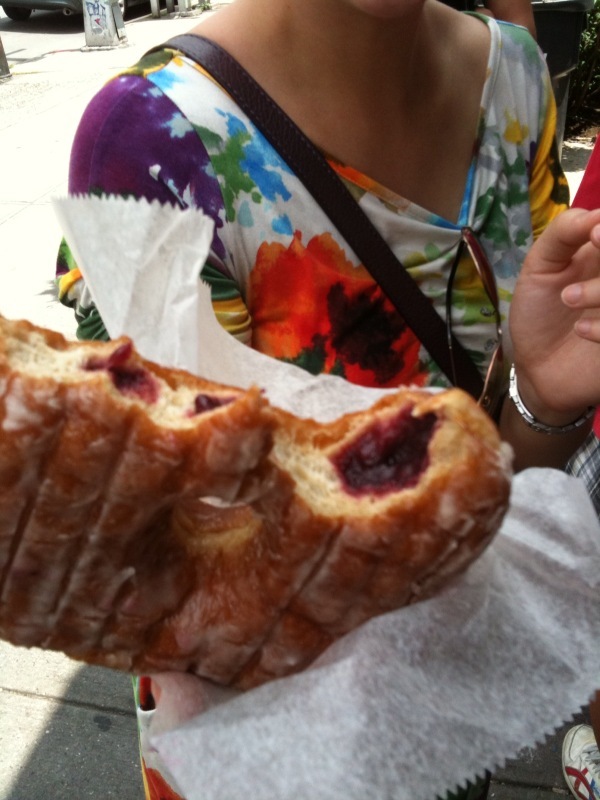 We also had to try one of DP’s signature square-shaped raspberry jelly-filled doughnuts. 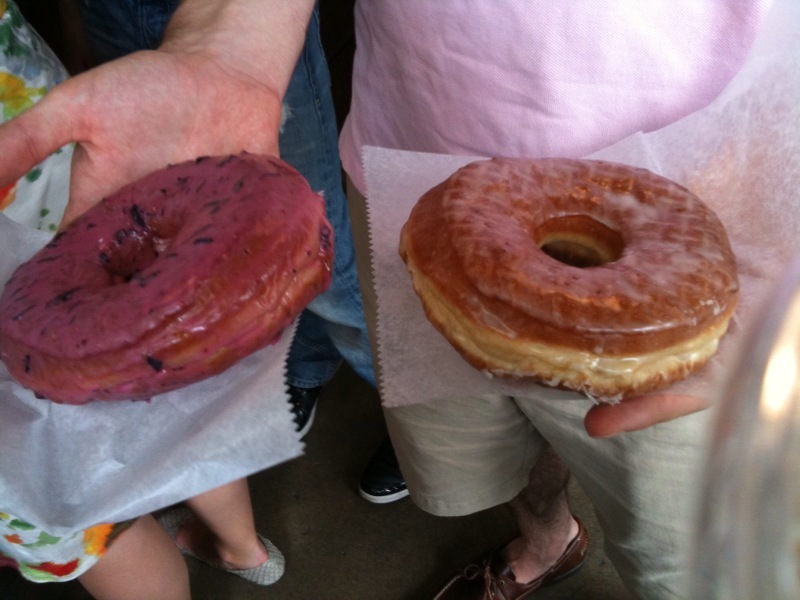 A Valrhona Chocolate doughnut and a Blueberry doughnut, two of DP’s current seasonal offerings, rounded out our order. The light, soft texture of each doughnut completely blew me away. It was as though cotton candy and a doughnut got together and had a baby doughnut–each bite literally melted in my mouth. And the taste of the dough itself is perfect–subtly sweet, but not overdone. The sign of a well made doughnut: a soft and pillowy center. The jelly-filled doughnut had a generous serving of home-made raspberry jelly, and the filling itself was packed with the sweet, slightly tart flavor of raspberries. The jelly was so intense and dark that Trusty and I wondered if maybe it was a mixture of both red and black raspberries? 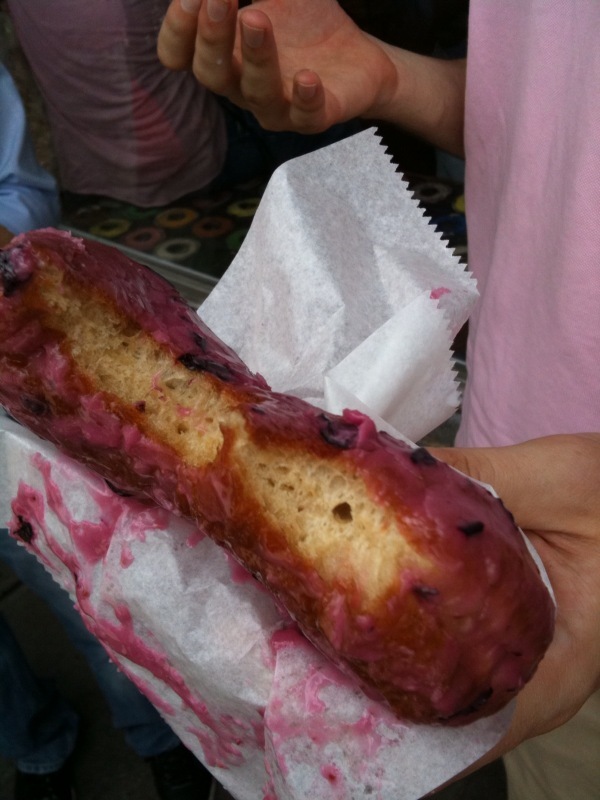 The Blueberry was a big hit–the glaze was full of fresh, sweet blueberries that gave the doughnut great flavor. The other doughnut that came out on top was the Valrhona Chocolate. I’ve never tried Valrhona chocolate truffles, but this doughnut made me want to! 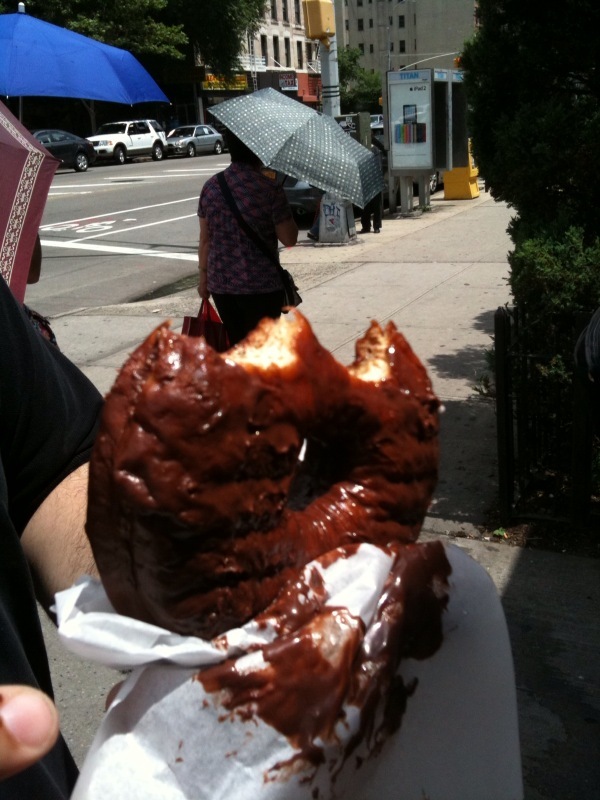 The flavor of the thick chocolate glaze was rich and intense–this was not your ordinary chocolate-glazed doughnut. Can’t wait to go back and try more flavors SOON!